The sous vide revolution is in full effect! If you have not tried this type of cooking yet, you are truly missing out! And if this method is new to you, let me explain to you what it is. Sous vide is low temperature cooking that involves vacuum sealing food items in heat safe cooking bags and placing them in a precision temperature water bath for a period of time. Your food maintains it’s nutrients and remains juicy and flavorful. Pork does particularly well when cooked with the sous vide method. In this recipe these thick cut pork chops spend a few hours in the water bath before being breaded, deep fried and topped with a yummy Meyer lemon sauce. Please subscribe for recipes and my sous vide cookbook published by Page Street Publishing is now available for pre-order! Links Are Below. Enjoy! Preheat the sous vide bath to 140F. Season the pork chops with salt and pepper then vacuum seal them 2 chops per bag. Place them into the water bath and cook for 4 hours. During the last 30 minutes of cooking, prepare the sauce and preheat your deep fryer to 375F. Mix the cornstarch and water in a small bowl until it forms a smooth paste. In a saucepan heat the olive oil over medium high heat. Add the shallots and sauté until they soften and become translucent, about 6-8 minutes. Add the garlic and cook until fragrant, 30-45 seconds, then add the cream and lemon juice and bring to a boil. Lower the heat to medium low and simmer for 5 minutes. Stir in the cornstarch mixture and whisk until it slightly thickens then stir in the cheese until it melts, and add the zest. Taste for seasoning and add salt and pepper as needed, stir in the fresh basil and remove from heat then cover to keep it warm. Toss the fresh oregano, cheese, and basil in a bowl with the panko until mixed and place the flour and eggs in separate bowls. Remove the pork chops from the water bath, take them out of the bags and pat dry with paper towels. Dredge each chop in the flour, then the egg, and finally into the seasoned panko. Drop each of them into the deep fryer one at a time (unless you have a fryer large enough for 2) and cook for 6 minutes or until they are golden brown and crisp. Place on a cooling rack for 5 minutes and serve topped with the lemon cream sauce and side dish of your choice. In the above picture I served it with gnocchi and charred broccoli. 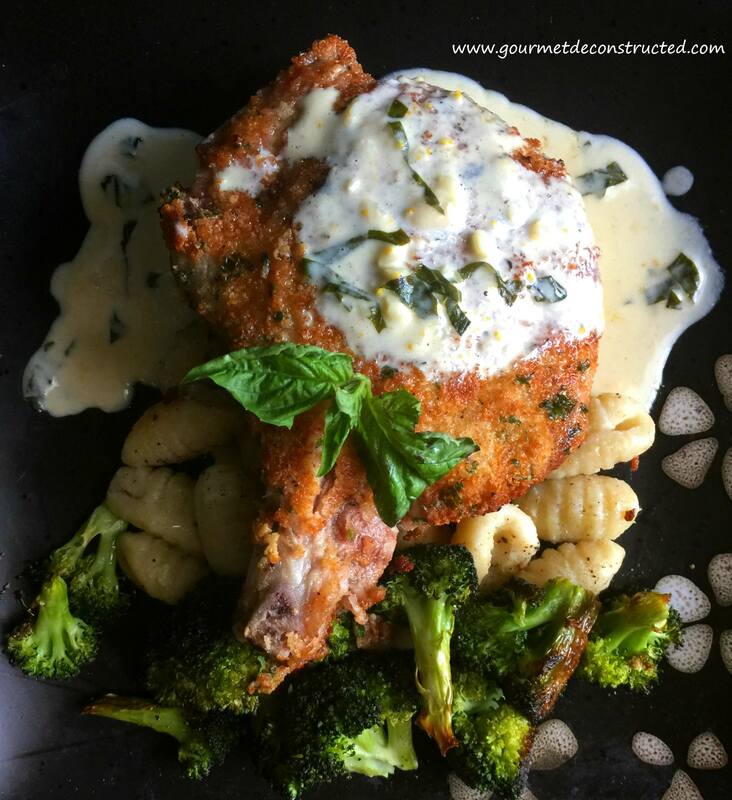 Posted on August 25, 2018, in Food, Pork, sous vide and tagged cookbook, cream sauce, fried, herb crusted, meyer lemon, panko, Pork, pork chop, sous vide. Bookmark the permalink. 5 Comments. Looks lovely Justice. I have a pork chop sous vide due on the blog. Much simpler than this, but pretty good all the same. Nice must try this method of cooking someday looks amazing.